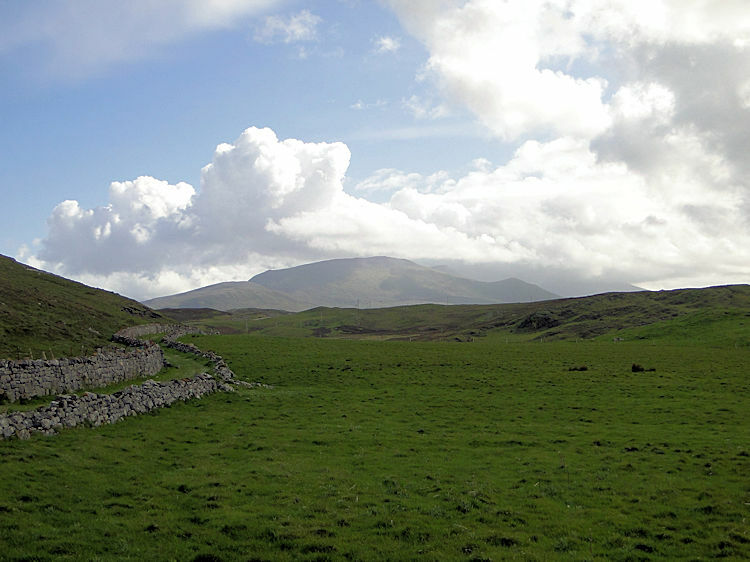 This was not the planned start of my epic walk on the full length of Great Britain from north coast to south coast but the weather conditions when I arrived dictated that I could not get to Cape Wrath without delaying my start and compromising the itinerary which had taken months to plan. An unfortunate start but the plan of starting from the Faraid Head peninsular was the perfect alternative. I was booked into Angela MacKinnon's Bed and Breakfast at Kyle of Durness for the evening and so with the Kyle of Durness Ferry closed until a break in the weather I undertook this stage one day earlier than planned. Doing so would get me back on track and rather than be behind schedule immediately I would keep to plan. I arrived in Durness, the most north western village on the British mainland and the fun started. I reached Durness at 3.00pm to be greeted by a howling gale. The locals have told me that Cape Wrath was not accessible and would not be for some days yet because of the strength of the wind and short term forecast so I made my alternative route plan. 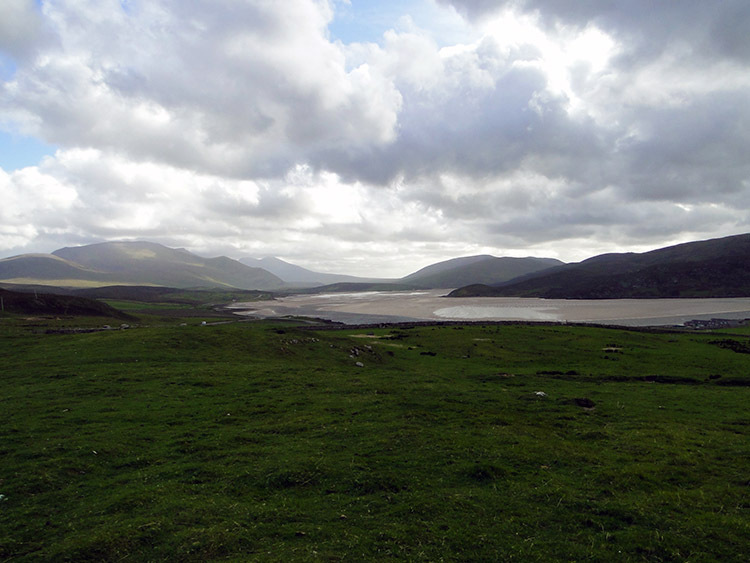 Thus I walked from my lodgings at the Kyle of Durness to Durness village and then continued on walking and made my way to the coastline at Faraid Head before taking time at the trig point to reflect on the journey ahead of me. Before turning back and beginning my long journey south to The Lizard I also took time to observe the beauty of the coastline and the fresh blue sea, looking much more inviting than it really was with white horses betraying the impression of calm. The outbound walk was tough with the wind keeping me alert and once I began my walk proper it got even harder. The strong westerly wind was in my face now and when it rained as it did on a couple of occasions it smacked me straight in the face like the lash of a whip. It stopped me in my tracks and made me turn around, it was that bad. I was also hungry and planned to go into Durness in the evening but this extra stage and the expected rain in the evening made me decide to eat while on the walk. 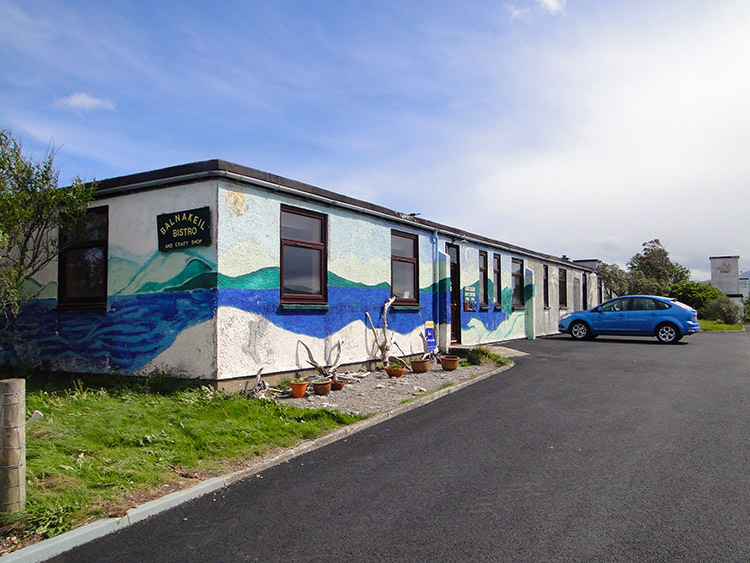 The one shop in Durness only offered cold food, I needed something warming and the only option was the cafe in Balnakeil Craft Village which to my fortune was open and I took without a second thought. The selection of food was typical cafe fare but I did not care, I chose soup and a toasted cheese sandwich, scoffed it down and continued on my way south. The walk on Faraid Head and the firm sandy beach of An Fharaid to the craft village had been easy, wind apart that is, and from the craft village I was provided with some shelter by banking west of Loch Croispol and by a stone wall which followed the meander of the track taking me to the main road. I followed the road for just short of a half mile until I reached a cairn where my host Mrs MacKinnon had told me to leave the road and track over the fields to her cottage. Crossing the fields I encountered a herd of sheep who looked on me very curiously. Not many walkers pass this way I mused. 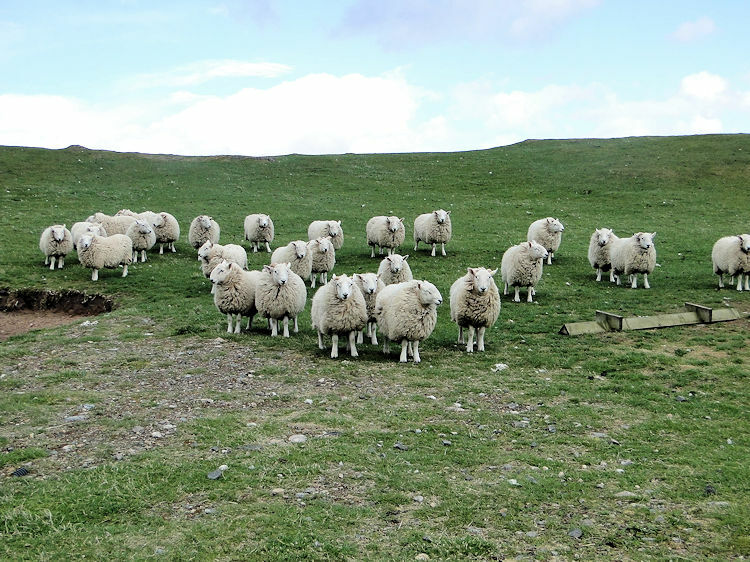 On passing the sheep I noticed they were suitable clad in woolly fleeces for their far north environment. Soon after I reached the far side of the field and reached the cottage. Just in time too, I had been back just five minutes before it started raining heavily. The predicted storm had arrived and it was to stay all evening and into the night. 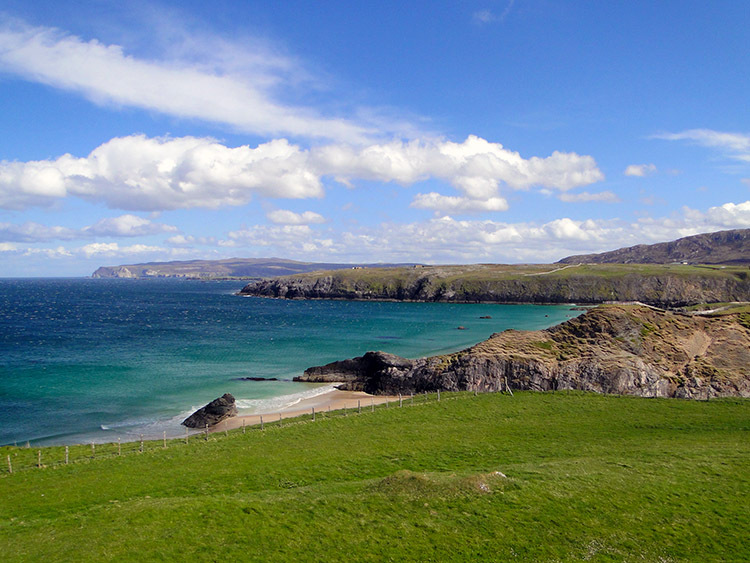 There is a very popular event in Durness this weekend, a marathon called the Cape Wrath Challenge. 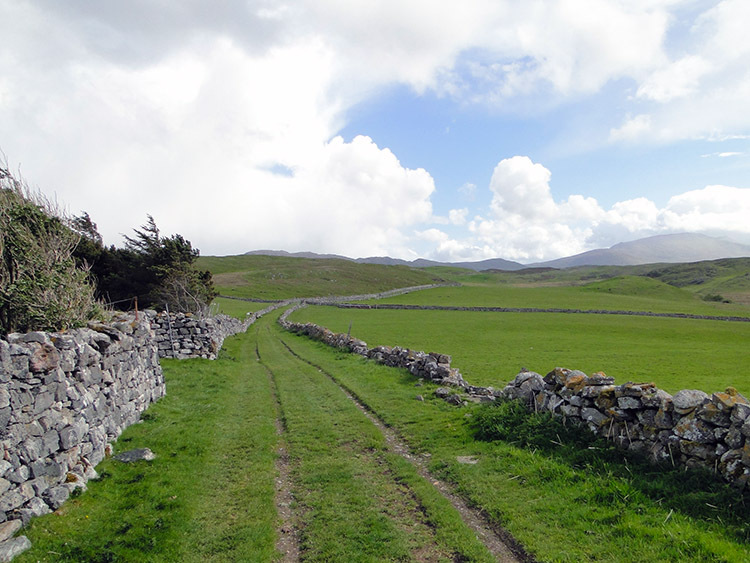 For the first time in years the marathon route has been changed as Cape Wrath cannot be accessed by the only route possible via the ferry across the Kyle of Durness. So the marathon runners and the Walking Englishman have to improvise. I have already done so, my walk from the north west coast of Scotland to the south west coast of England, a route down the full length of Great Britain has begun. I have done four and a half miles which seemed like ten miles as I struggled into a roaring head wind. My incredible adventure has begun.